Be cautious of under capacity computers that don’t meet the Hino’s DX2 specifications. 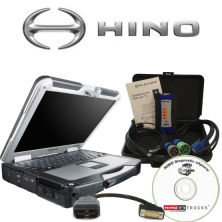 Our computer meets and exceeds the specifications for Hino DX2. OBD2 connector cable for use with the Nexiq USBLink 2 only. Please note that it’s not compatible with the original USBLink.